By: Deogratius Ssemwanga, Jonathan Kayondo, Siva Danaviah and Jaffer Zaidi. 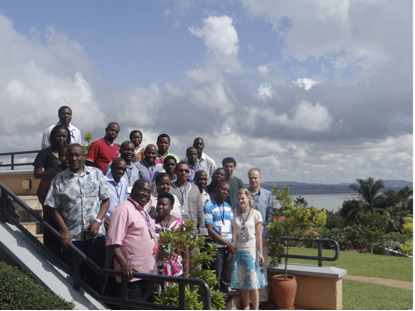 The bioinformatics in the tropics series is part of a south-to-south capacity building programme to develop the next generation of bioinformaticians in Africa and Latin America. The workshop was jointly funded and organized by the Makerere University/Uganda Virus Research Institute Infection and Immunity (MUII) Training Programme, Wellcome Trust, the MRC/UVRI Uganda Research Unit on AIDS, the Africa Centre for Health and Population Studies and the University of Kwazulu-Natal, South Africa. The workshop was designed for scientists, graduate students, postdoctoral research fellows, and exceptional undergraduates interested in becoming familiar with tools for phylogenetic and genomic analyses. The course attracted over 35 applicants but due to space limitations, 25 participants from several African countries including Uganda, Kenya, Zimbabwe, Malawi and Sudan were invited to attend. Eight (8) course teachers from Uganda, South Africa, the United States of America and the United Kingdom facilitated at the course. The four-day workshop involved theoretical lectures and practical sessions on the usage and interpretation of bioinformatics applications for the study of small and large data sets of HIV and other genomic data. Softwares used in the practical sessions include PHYLIP, PAUP*, PHYML, MEGA, TREE-PUZZLE, BEAST, Simplot, MrBayes, RegaDB and other software. This workshop also included statistical analysis of HIV drug resistance and phylogenetic inference and interpretation of phylogenetic trees. The first day of the workshop had a lecture on the general introduction to phylogenetics and its biological applications, which set the ground for the course. The course took the students through the various sequencing technologies, denovo sequence assembly and quality control. The students were taken through the theory and practical sessions on sequence alignments. On the second day, more practical sessions on multiple sequence alignments were held. This was followed by lectures and practical sessions on the easy maths of trees, the basic principles of building and interpreting trees. A keynote presentation open to the UVRI community on the Molecular Epidemiology of HIV-1 in concentrated Epidemics was done. Students were later through a practical session on phylogenetic graphics using the Cluster Picker software. The third day involved lectures on the various substitution models, JModel test and a practical on Maximum Likelihood using PhyML. A second keynote lecture open to the UVRI community on exploring epidemic structure in HIV and influenza using phylodynamics was made. This was followed by a practical session on Bayesian inference using the BEAST software. The fourth and final day had a theory and practical session on detecting recombination using the various available free online and commercial softwares. Students were later taken through the processes of generating and analyzing HIV drug resistance data. The various drug resistance databases were also explored during this session. Students at the workshop were also encouraged to utilize their own sequence data with the help of the teachers. The course was concluded with a certificate award to the students and a workshop barbeque. The course feedback was very encouraging with useful suggestions on how best to improve future courses. The south-to-south series have been a success and we are looking forward to continue this model of collaboration possibly even in other areas.